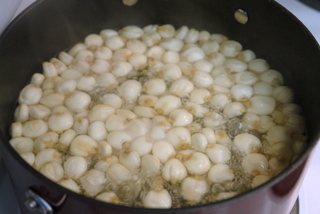 Mote, also known as hominy, is made from dry corn that is “peeled” by soaking and cooking it with calcium oxide, also known as cal in Spanish or quicklime in English. My mom used to make mote using dry unpeeled corn, she had this huge pot and would put it on a wood burning stove in the little hut (which she called her fabrica or factory) next to our house, the process to “peel” the dry corn would take a whole day, once the corn was peeled she would boil it until it was puffy and soft. The type of corn that grows in the Andes – actually there are several different varietiesof corn -, but the most common type is different than the one found in the US (and Europe),the kernels are larger, drier and not as sweet – I was so shocked at how sweet American corn was the first time I tried, I was sure someone added sugar to it, and while I’ve grown to like sweet corn it is still a challenge to adapt certain Ecuadorian corn based dishes using local corn, but it works out. About 10 years ago, whenI moved to the US, it was very hard to find mote or hominy and the only kind I could find was canned and already cooked,which was convenient because you just had to drain it, rinse it and use it, however the flavor of freshly cooked mote was missing. Recently I discovered that it is possible to find the dried mote – which has already been “peeled”-and is ready to be boiled, the corn has to soak overnight and does take a few hours to cook, but it is so worth it! After eating this way it is very hard to go back to the canned version – but I still keep a can of hominy on hand just in case I have a last minute craving or need it quickly.You can find the dry peeled corn at some of the Latin grocery stores, it is called Maiz Mote Pelado and comes in 1lb bags – usually next to all the dry beans/peas – you soak it overnight and boil it (just like you would with dry beans). 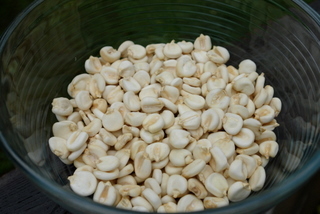 Hominy is a great side dish, in Ecuador it is frequently served as a side to a lot of different meat dishes; simply add some salt (if needed) and it is ready. If you want to give the hominy a little bit more flavor you can also make a quick refrito (onions, garlic and other spices sautéed in oil or butter) and mix it with the hominy. A classic dish in the Andean highlands is mote pillo, a dish of hominy and eggs, it is one of the best breakfast dishes.Hominy is also added to soups and can also be ground to make dough for empanadas or tamales. Rinse it well, place it a large pot with plenty of lightly salted water and boil over medium heat until the corn is soft and starts to “pop”,about 2-3 hours, stir occasionally and add additional water if needed. Drain and cool down, can be served plain as a side dish or used as a component for other dishes. Thanks for the recipe. I bought some mote pelado for a bean and hominy chili recipe. Would anyone be able to tell me if I can cook the beans and hominy in the same pot? I haven’t tried that, but depending on the beans they might need less time than the hominy to be fully cooked. Hi, I was so glad to find your site. I have been looking for a dry hominy for a friend, but in the rural area where I live – the only place to find it would be to order it. I ordered some Goya and it came yesterday. I was so disappointed. It was little tiny pieces of Cracked Corn that doesn’t even resemble Kernals. I thought it would be whole kernals that when soaked and cooked, would resemble canned Hominy. I don’t know what the Goya I purchased would be used for. 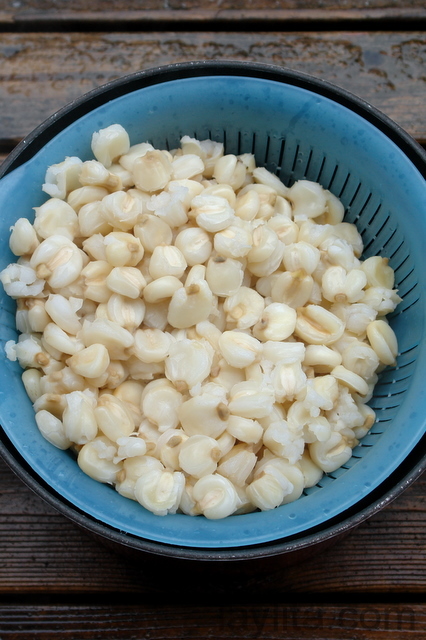 In my younger years, I use to make Hominy with Field Corn and Lye and it always turned out Great. 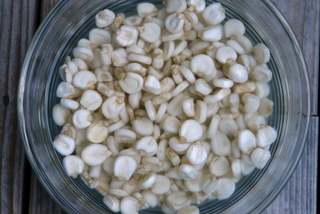 After finding your site, I did a search for Maiz Mote instead of searching for Hominy, and came up with the Peruvian Dry Hominy. Do you think this might be what I am looking for? 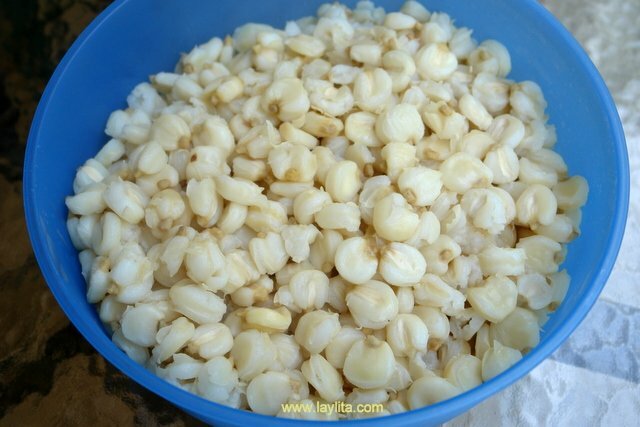 Hi Bes – Yes, the Peruvian dry hominy is the same as Maiz Mote, and even Goya does sell the same whole Maiz mote kernels. 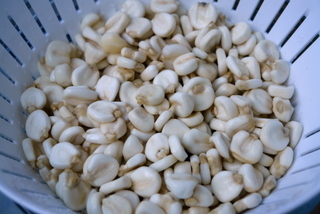 The cracked corn can be used to make soups (sopa de morocho) and also the sweet morocho corn drink. THANK YOU, THANK YOU, THANK YOU!! All my “mote gigante questions” were answered here. Your explanation was very precise, clear, and easy to understand…so all I can say is: “Let the Mote cooking begin!! !” No, but seriously, Thanks! I’m not Ecuadorian, but I have tried a couple of wonderful meals such as cebiche ecuatoriano, sopa de bola. pan de yuca,humitas and recently a delicious tamal de mote. I tried to get the recipe but I couldn’t. Can anyone do me that favor and email it to me? All I know is that the person soaked the mote overnight and the next day she grinded it and made a kind of dough with butter and eggs. I know she used a kind of banana leaves to wrap them, but someone said those may have been achira leaves. Is it? In my country(south america) achira is a breautiful and colourful plant that grows very tall. I am absolutely wowed by your recipes, pictures and narrative. I have found your suggestions of what ingredients to use here, in the Pacific NW, invaluable. I currently live in Pasco, WA but years ago I spent a few years living in Quito and have longed for cafe con humitas, fanesca, chochos, chaulafan and other wonderful dishes that I thought could only be had in Ecuador. Thank you from the bottom of my ecuadordian-american heart for your beautiful site. As another reader posted, you really should consider publishing a cookbook. Is that something you are working on or would consider? I do have one question, do you know where I could find chocho beans here in the NW and if they are dry how do you cook them so they aren’t bitter? I have ordered them canned from http://www.amigofoods.com but I’d love to be able to pick them up the next time I am in the Seattle area. Hi Nicole – Thank you for your comments. No plans for a cookbook now (maybe in the future when I retire from my real job)…I found chochos (also called lupini beans) at The Spanish table in Seattle, they have them both in a jar in brine (just peel them and use); they look a little bit different than the nice white round ones we have in Ecuador but they are still decent. I also bought some dry ones there but haven’t had chance to cook them yet, I’ll let you know how they turn out. in pastel colors and it tasted like grannies best pudding after cooking with logs in a bon-fire for 20-30 minutes! INCOMPAREABLE!!!!!!!!!!!!!!! IF YOU HAVE A GOOD SOURCE FOR MOTE DROP A LINE LEMEKNOW! I have the dried Mote from Peru and make it sucessfully. However, after soaking, I am removing the tiny hard tip of the kernal (where it was attached to the cob). This takes a lot of time but the Mote is better… I believe. Is this step necessary? Hi Stephen – I haven’t tried that, the tip of the mote softens and taste fine when cooked. Hi Laylita, I love your blog, it’s so beautifully done, I can’t wait to try the mote, Thanks so much for the delicious recipes. But i have a question about the Arroz con pollo. I did your recipe a couple of months back and it was out of this world. but i didn’t save it, so i came back looking for it and it’s completly gone from your site. can you reprint it so that i may save it properly this time. Humitas actually do work with North American corn, in part because humitas should be a little bit on the sweet side (in Ecuador sometimes a little bit of sugar is added), and I also add some corn flour to make up for the lack of starch. Laylita is right… the more starchy corn that is indigineous to Central/South America really makes a difference. North American corn is too sweet and if you tried to make humitas, tortillas, or tamales with it, you would end up hating it. PS – If you want to learn how to make corn tortillas or tamales, rent a book by Diana Kennedy or Patricia Quintana from the library. You will never go back to storebought again! Your point about sweet corn is right on. I have not spent a lot of time in Ecuador, but have an ex-boyfriend from there and when I visited it was the corn festival. I have looked so hard to find proper choclo in the States (I live in New York City) but have only been able to find a couple of frozen brands – they’re OK but not the same as fresh. Do you know of anywhere to get fresh Andean corn in the U.S.? I was also very excited to see your recipe for humitas (another corn festival memory) and look forward to making it soon! Thanks so much for the delicious recipes and tips on cooking rice. My husband lived in Ecuador for a few years and is always talking about the arroz con menestra–rice and beans–that he loved there because of the flavor of the beans. I searched your site and can’t find anything like that. I’d love to see a recipe for it to try to make it for him. Thanks again! Hi Catherine – I have a recipe for arroz con menestra, but using lentils instead of beans, the menestra with beans is very similar, same vegetables and spices. My mom makes a great menestra de porotos (beans), I’ll share the recipe one of these days. How interesting. I’ve always wanted to try hominy, but I have yet to find it here. It is rice to us I guess. In India, most of the side dishes are had with rice or wheat tortillas. So where do you get mote in Seattle? I want to make pozole for the first time, and wanted to try it with the dried corn. Or, do you recommend the Mexican hominy? I found a recipe on Epicurious. Hi John – There a couple of places that have mote in Seattle, the first one is the El Mercado Latino in Pike Place Market, another place is La Espanola in Bellevue. The mote I used was the Goya brand but I also saw there is a Peru Foods brand (haven’t tried that one yet). I’m sure there are other Latin grocery stores in the Seattle area but those are the ones I usually go to. I’ve never made pozole so I’m not sure which is better to use, but based on taste comparison of the canned Mexican hominy vs. boiling the dry peeled corn I prefer the taste of the latter. Also, there is an Ecuadorian soup made with mote and pork, called mote pata, for that soup the mote is usually added already cooked (so you would either boil and cook the mote separately or use the canned version), I’ll try to get that recipe posted soon, it’s a great winter soup. I love that you share some of your secrets of where to find things there in the states. That is good information for when I am there and need things like this! Been missing your posts! They are always so beautiful and delicious! I wish I could find this speciality here! Thank you for this! I need to start trying different ways to prepare mote because my husband is tired of eating mote pillo, lol. I love it though. We make our mote in the pressure cooker because it’s much faster that way.